Though they begin in a familiar way, these are not your typical toe-up socks. The feet are worked on the bias; then short-row wedges and a heel flip the bias to the opposite direction for the leg. 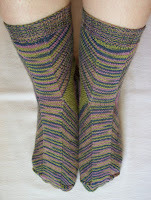 Self-striping and variegated yarns work very well to showcase the unusual construction in this pattern. 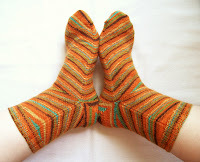 Another sock construction experiment, these begin at the heel with a small square and are increased outward before splitting in two for the foot and the leg. 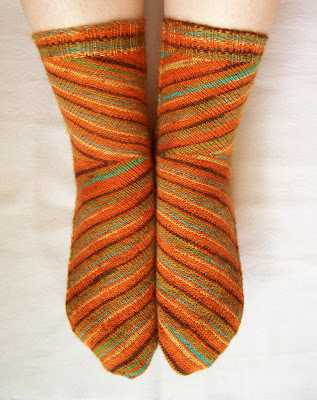 The varying stitch-counts create an interesting effect with variegated yarns.